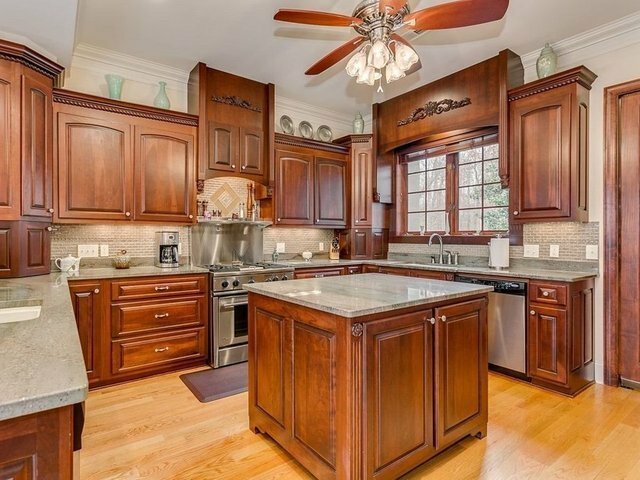 Quality, craftsman waterfront living in one of the most prestigious communities on Lake Keowee. Meticulously constructed down to the last detail, this home offers numerous features that make it stand apart from the rest. As you pull into the private drive, you'll know you've found it. The quiet, mountain lake styled setting you've been looking for, complete with a quality custom built home overlooking the main channel of Lake Keowee.The rear of the property has manicured mature trees that shade the professionally landscaped back yard offering a clear view of the open water and picturesque backdrop. The desirable craftsman style is made most appealing by the use of quality materials throughout. The stone accented exterior with professional landscape detail is only one of the craftsman touches this design offers. The main level has over 2600 square feet of purposefully designed space.Upon entry you're greeted by an inviting foyer with Imported Murano Glass fixtures leading to a spacious, open floor plan. Picturesque views provide the backdrop for the palladium glass windows along the entire lakeside. This home offers numerous unique features both inside and out. Cherry wood built-in cabinetry adorn both sides of the stone fireplace. A coffered ceiling and stained accent beams add to the warmth of the living room. High-end engineered hardwood flooring, 8' solid doors, extensive stain grade and custom trim are just a small example of the high quality you'll see throughout this home.The Chef's kitchen features two separate ovens, two dishwashers and two sinks. Through the gourmet kitchen is a staple in lake living, the spacious signature covered porch. This ample sized living space features a stone fireplace with outdoor television, surround sound and low-maintenance ironwood decking accented by stone arches.There are stone walkways and landscaped paths that lead gently through the outdoor living featuring a paver patio and ultimately ending at the covered slip dock with 14x10 power operated awning, 6,000-pound boatlift, ample lakeside seating and natural sand beach. Multiple porch areas, covered and non-covered, capture the pristine emerald green waterfront. The main floor master suite boasts two huge walk-in closets, a two-person Jacuzzi tub, double shower with dual sets of body sprays and a two-way mirror for watching the news while getting ready for your day.The home's fully finished terrace level features a custom bar/kitchenette with marble tile and third dishwasher. There is also a large den or game area, two large bedrooms, a home office or optional third bedroom with tall ceilings, ample closet/storage space and two full baths.Over the garage is a complete in-law suite offering a living area, spacious bedroom and private full bath. A side entry lake bath just off the covered terrace patio adjoins a large lake toy storage area for life jackets, kayaks, canoes, rafts etc.Too many features to list. Contact agent for full listing of features and details.Convenient by water for lake fun; the Lighthouse Restaurant is the next cove north. An upscale Crescent Community within 5 miles to the town of Seneca for shopping, restaurants, grocers and medical facilities. Waterford Pointe features a Jr Olympic sized swimming pool, tennis courts, playground, grill area, horseshoe pit, walking trail and more... Enjoy the lake, love the home, embrace the lifestyle!